Gather ideas from nature to create beautiful prints. Learn to transfer drawings and designs to block prints material. Print with a variety of paper and colors. Make a rainbow print. They will then trace the drawing on a 9x9 square of soft-cut material and gouge it out to make a block to print. They will then print with a variety of ink colors on a variety of color paper, even learning how to make a rainbow print. After the first block we will explore textures in another soft-cut block and share the blocks with the group to make a collage of texture. Finally they will experiment with the blocks they make to print one over the other an create new pictures. These prints can then be made into note cards or a booklet. This camp focuses on various ways to represent the internal and external self using writing, found material, and illustration. Activity ideas: Identity hands Free write, use vocabulary to create poetry/visual art Mirror contour draw Collage self-portrait Culminating project - inner/outer identity mask using either drawing, words, collage, or some combination of the three to create a representation of their external self and internal self. Study the music, dances, films, food, clothes and technology of a decade of your choice. Whether you love the 20s or 60s America, Revolutionary France or the Renaissance you will create homage to your favorite decade. Artists will go through material and find things that fit the defining spirit or mood of your chosen time period and illustrate the ideas and beliefs through sculpture and collage. Communicate a pivotal event or figure of the era via charades and without words create a sculpture of one of the most cutting edge technologies of the time…clothing! Design your Decade outfit. Return to “once upon a time”. Knights, Dragons, Unicorns, Ninjas, Fairies, Elves, Samurai. In this camp kids get to turn fantasy to reality through art! Campers will construct costumes from fabric, cardboard, and reclaimed materials. Imaginary worlds of dragon’s dens and fairy houses come alive with paint and plaster. Every unicorn horn starts with a dream...and a little glitter. Drawing for kids who love to draw: And those who want to learn… Expand your drawing expertise and sharpen skills in perspective, shading, value, contrast and more. Explore portraiture, landscape, and still life. By looking at contemporary artists twisting the fundamentals of art, campers can take their drawing to a new level. What does the world look like from an ants eye view? What do you see if you are a giant? Love to draw and feel ready to give your work drama and depth? Come on down and practice creating drawings that reflect the view point of humans, birds, worms, and giants! Impress your friends and family with your new found skills and enjoy using the tricks that the pros use when creating environments for characters to live and play. Love paint? Can’t get enough of the stuff? Join this camp and explore the mystery of color and paint, paint, paint. Mono-chromatic, complementary, analogous, WHAT? These are the terms the pro’s use and you’ll get to practice them too! Participants will use acrylic paint to learn and explore the ins and outs of painting and creating the colors you want to paint with all the tints and shades! Everybody paints on paper and we will too, but we will also paint on unusual surfaces like objects we find in nature. Using these as your canvas you will use watercolor, acrylic, pastel, pencil (regular and colored), and mod podge. Investigate the idea of thinking color, we see color, but what would thinking color be like? This camp is truly a variety pack of painting projects. Come join the quest to make the perfect cookie! We bake several types of cookies each day exploring different cookie styles such as drop, bar, shaped, refrigerator and sandwich, and a range of flavors including sugar, gingerbread, cocoa, chocolate chip, and oatmeal. Along the way, we learn the basics of baking and a dash of personal creativity. Transform thrift store garments into high fashion creations. Go where your creative ideas take you! Turn a polyester blouse and pair of paisley pants into a purse; a men’s shirt into a cute dress. We focus on generating creative ideas, as well as machine and hand sewing skills, learning a wide range of techniques to add decorative embellishment to our creations. Camp ends with a runway show for family and friends. Love being outdoors? Love making stuff? 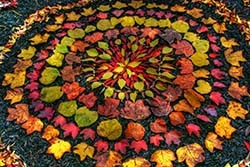 Ever heard of Andy Goldsworthy? He loved those things too. Find yourself in the great outdoors designing natural sculptures out of the natural things you find around you. Learn who this amazing British sculpture was. Collect rocks, plants, and other materials, make some design sketches dream up something fabulous. Use shape, texture, pattern and imagination to create something unique. The sculptures will be temporary, just like Andy’s, but we will record then photographs and drawings…just like Andy! Calling All Artists! 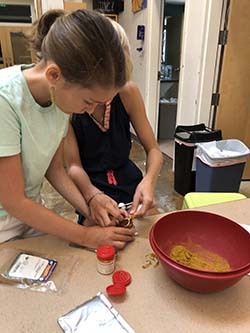 In the Open Studio, campers will explore a variety of materials, techniques, and artistic styles just as artists do -- as they experiment, make, and play. Campers can paint, sculpt, weave and sew, collage, and draw -- whatever suites their fancy -- and will come away with original works of art. This camp will culminate in an exhibit for friends and family. Campers who love to play Lego video games are inspired by this opportunity to learn and apply stop motion techniques to their love of Legos. We develop simple stories in two person teams, envision and build a Lego cast and set, then learn and practice stop motion to tell our stories entirely out of Legos. Art and technology supplies and equipment use included. In addition to their superhuman powers, a superhero needs a great name, dope costume, and an action-packed life with arch-rivals to overthrow and cities to save. In this camp participants will create a superhero name and design their insignia. Make a screen print or block print of their logo for costume design and dye and decorate their super hero masks, capes, gloves and shirts; add your superhero logo. Each superhero will create their Hero FAQs including power, arch rival, and most difficult fight to date, favorite animal, and alter ego’s job. With great power comes great responsibility! Explore the fiber arts. Step back in time and spin yarn using an old fashioned drop spindle like the maidens of the Middle Ages, Dye and batik like the tribes of Indonesia. Weave the yarns and fabrics we make into wall hangings and create a talisman doll from collected items from nature and our homespun yarns. Back by popular demand! This class combines art and cooking as students explore the cultures of other countries through visual and culinary art. Participants will "travel" the globe as they create healthy and exotic foods and enjoy the fruits of their labor each day with a sit down lunch together. If you love art and love to cook then this is the class for you!